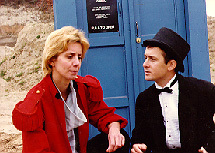 With Kill Roy in the can (but not completed) in the fall of 1983 I became a die-hard fan of Doctor Who. Early in 1984 I read that the World Science Fiction Convention in LA that year was going to have a film contest with judges like Gary Kurtz (the producer of Star Wars). I decided it was about time to do a science fiction movie and Doctor Who seemed a logical extension of this. I knew I couldn't compare with the Tom Baker episodes that were being run (practically the only exposure I had to Doctor Who at the time), so I decided I needed to do something that would be a complete departure from anything anyone had ever seen on the show before: a female Doctor. Barbara Benedetti (left)was cast in the part on the recommendation of A.M. Collins, a Seattle playwright whose Angry Housewives Barbara was currently appearing in. Barbara had no idea who Doctor Who was, I think she just took it on faith that I had made the whole thing up. Barbara then recommended her co-star, Randy Rogel (then playing a character in Housewives called "Lewd Fingers") to play Carl the Chimney Sweep. In the 1990s Randy was a writer on Animaniacs for Warner Brothers Animation. A script he wrote for Batman: The Animated Series won an Emmy in 1993! Today he writes for Disney Animation. The script (originally written by me and heavily edited by Cheryl Read, Linda Bushyager and Deb Walsh) went through many drafts, including one less than a week before we began filming. This drove my production manager, Mark Schellberg (who can briefly be seen near the end of the film as a tied-up workman) nuts, since it was his responsibility to plan out the film's logistics. Except for some rain, filming was efficiently accomplished over a 10 day shoot. Because of the deadline of the Worldcon's film contest, I had less than 60 days to complete editing and have a print out of the lab. Many restless nights were spent trying to get the film ready, with the only break taking place during Westercon where a special trailer was shown. The 4th of July weekend was also when the 2nd Unit filming took place in order to capture the shots of the stone pillars the Doctor and Company find in the woods (if you notice very carefully you'll see the actors and the pillars are never in the same shot together -- the grass was about two feet shorter as well when we got around to the last shots). The film was completed on time and sent off to the Worldcon. Meanwhile, the premiere was held very early on a Sunday morning with no publicity whatsoever at Timecon in San Jose, California. My spies at the Worldcon informed me that only the finalists would be actually screened for attendees at the con -- but I could count on being shown -- wink, wink, say no more! Needless to say, I went overboard on the publicity machine printing up dozens of flyers to spread all over the convention to alert everyone to the screening. As a result, the room was packed as my film was shown. Sadly, two-and-half hours later (with the room nearly empty), someone else was announced the winner, but at least people had seen my movie. What was really strange was as we were leaving the room I heard someone say, "Gee, I didn't know the BBC had a female Doctor." Did someone think this was genuine BBC product? 30 minutes. 16mm. Filmed June 1984, released August 1984. Cast. . . Barbara Benedetti as The Doctor, Randy Rogel as Carl Evans, Jim Dean as Grant, Kevin McCauley as Harris, Michael Smith as Tate, Tom Lance as Wallace. Like our 30th Anniversary Facebook Page. If I had a dime for every misspelling of "Utomu", it would have paid for the movie! 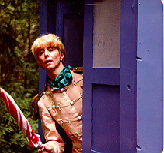 In August 1985 I formed the Doctor Who fan club, The Society of the Rusting TARDIS, the secret agenda of which was to help me make another movie. My co-conspirator was an employee of Group W Cable (now Comcast), Howard Carson, and he said he could arrange for us to make the entire production using equipment at the Public Access Studios of Group W for a fraction of the cost of what Wrath of Eukor cost. Even though I wasn't thrilled with the idea of shooting on videotape (3/4" videotape for that matter), I figured at least it would be in the spirit of the real BBC Doctor Who show. The following weekend we spent two days in relative warmth at the Group W public access studios in North Seattle. This was probably the harshest shoot I've ever done: I had to record nearly 12 pages of dialog in one day! It was a killer. But we got it done. Jim Dean returned from Wrath of Eukor to play the King, and future writer T. Brian Wagner had a small part as well. 32 minutes. 3/4" videotape. Filmed November 1985, released January 1986. Cast. . . Barbara Benedetti as The Doctor, Randy Rogel as Carl Evans, Wesley Rice as Utomu, Stasia Johnson (no relation) as Princess Aldraina, Robert Eustace as Prince Germain, Jim Dean as the King, Randy Dixon as the M.C., Joseph McCarthy as Formore, and an orange (eagle-eyed spotters will notice that as a joke there is an orange in every scene in the movie -- the crew found this endlessly amusing). Written, Produced and Directed by Ryan K. Johnson. With it being 1986 and two Who films behind me, I felt it was time to move on and do something original. Events conspired against me however. I decided to apply for a grant from the King County Arts Commission in order to make a TV pilot for a science fiction TV show. Howard Carson meanwhile was developing a Doctor Who script by Andrew Dolbeck called Strange Gifts. The plot concerned the Doctor and Carl landing on a planet that worshipped death. Time Lords being virtually immortal because of regenerations were an abomination to the locals, who viewed the Doctor as Satan incarnate. The plot climaxed with Carl dying (! ), the Doctor violating the First Law of Time by going back to save him, and finally being put on trial by the Time Lords (remember, this was before Trial of a Time Lord had been announced as the 23rd season of Doctor Who.) A two-part script which included a cliffhanger was written and distributed to the actors. By this time, exposure on Public Access had earned an unexpected benefit: an actor named Michael Santo who was as nuts about Doctor Who as the rest of us had seen Barbara in the movies and wanted to know how he could get involved. Barbara relayed this information to me, and we wrote a specially-tailored part to take full advantage of Michael's strengths. Howard, who was to bankroll the movie, was involved in a car accident and ultimately had to declare bankruptcy. Then, while reviewing the script, Linda Bushyager raised some points about the plot which just simply couldn't be resolved. We realized we asked the audience to swallow just too much stuff. But taking any of it out would undermine the entire story. We had to shelve the script and start over. I should say too that we probably bit off more than we could chew in terms of the production value this story required. The few thousand dollars we had to spend just wouldn't have covered the cost of making what we had in mind. Back to the drawing board... I persuaded the King County Arts Commission to give me a grant of $1000 to make a pilot, so I decided to go ahead and do one anyway but put the Doctor in it. In retrospect, this may not have been the best move in the world, but it seemed a good idea at the time. The script as written was called Tripp In Space and it was intended to be a science fiction soap opera of sorts, with the pilot serving as the first two episodes. However, after filming the first half of the story, the entire production collapsed and we decided to rename the project and concentrate on what we had. 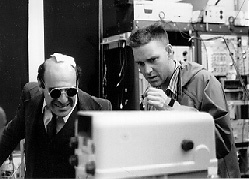 In consolidating the footage, some scenes with the Doctor and Komar (Michael Santo, left with Eric Anderson) were cut, and the ending changed slightly. 28 minutes. Betacam videotape. Filmed September 1986, released May 1987. Cast. . . Michael Santo as Komar, Laura Kenny as Iz (she once had a cameo on Northern Exposure as Death), Laura Sweany as Robin, Josh Conescu as David, Jonathon Stewart as Alex, Eric Anderson as Simon, Barbara Benedetti as The Doctor, Randy Rogel as Carl. Directed by Howard Carson. Written and Produced by Ryan K. Johnson. I was visiting Michael Santo at his apartment one day when he casually asked if I was going to be doing another Doctor Who movie. I told him it was unlikely, given the amount of time and money I had expended so far. Michael said I should and that he wanted to be the Doctor. "But I already have a Doctor," I told him. "Nah, Barbara doesn't care," he responded. I told him I'd have to think about it. It was true, Barbara had no innate love of Doctor Who though she enjoyed making the movies. Michael on the other hand was a True Fan and it was obvious he had been eyeing the role since watching my videos on Public Access. But I really felt Who-ed out personally. If Michael wanted to make a vanity project, why couldn't he pay for it? I talked to my a fellow filmmaker, Janice Findley (who had played "Adrian Barbeau's corpse" in Escape From Seattle), and asked her what I should do? Her advice was, "How often are you going to have these great actors begging you to be in your movies?" I had to admit, she had a point. The Rusting TARDIS members certainly weren't adverse to another production either. I decided we would do a small "wrap-up" movie to finish Barbara's tenure as the Doctor and to introduce Michael at the end. At the time we were planning the movie, Alan Moore's landmark comic Watchmen was taking the world by storm. I thought it would be neat to do something in the same style: a bit avant garde and surreal. I spoke with T. Brian Wagner (who had come up with some interesting proposals regarding The Prisoner), and asked him to come up with a script. My only requests were, "It be weird, 15 minutes long, and Barbara's dead at the end...she could trip on the sidewalk and kill herself, I don't really care how it happens." So T (as we referred to him) went off to work on it. By fall of 1987 T delivered a script to me, Broken Doors, that was exactly what I had been looking for. The only problem was it was way too ambitious for what we could afford to shoot. At one point we needed to build a British pub and have a big fight scene while the Doctor played chess with the mysterious Manager. I told him we'd have to cut it out (we lost a really great gag along the way though: in the scene Carl would be confronted by the publican who accused him of doing something nasty in his past. Carl would deny it at which point the man said, "What about...Barbara Johnson!" a play on both Barbara's and my name.) The second thing that concerned me about the script was it firmly implied that the Doctor did not like being a woman, and the entire story was a subconscious attempt to force a regeneration. I told T it had to go. He argued with me citing a line in Wrath of Eukor when the Doctor sees herself in a window for the first time and says, "This is worse than I thought. This is all wrong...This can't happen to me!" I said, "T, I wrote that line, that's not what it meant. The Doctor is always (nearly) unhappy with his appearance at first." T grumbled but I made him change it. The script now ready, I decided to once again hand off the directing chores to someone else. My friend Henry Gonzalez had been busily working on his sequel to The Count (and in fact, here in 2001 he still is!) with a fellow named Steve Hauge (rhymes with "howdy") as Assistant Director. I had observed Steve in action and thought he demonstrated The Right Stuff. I gave him a call and asked if he'd like to direct a movie for me. He had never been a director before but I said I liked the way he worked and I needed someone I could trust. Steve was completely unfamiliar with Doctor Who, but after an animated demonstration by me and a few videos, he felt he could handle it. Alan Halfhill was back as our cameraman, and Steve got the improbably named Lach (pronounced "lock") Loud to be the designer and set builder. Lach went from our production to the first season of Northern Exposure a few years later (look for him in the end credits as "Lachlin Loud"). Lach grasped immediately the surreal nature of the story and designed some remarkable sets that the Rusting TARDIS members began constructing in a warehouse near downtown (heated this time!). The movie essentially was a three-man (er, two men and a woman that is) show, so casting was not a problem. We decided to have Michael play the dual role of the Manager seeing as villains were his forte, plus the rather cool implication it had once he became the Doctor (we were already thinking sequel possibities). T's script had called for all sorts of things from the first three movies to reappear to confront the Doctor again. From Wrath of Eukor came the stone pillar. From Visions of Utomu came the ubiquitous orange. And from Pentagon West, the strange device the Doctor was going to use against Komar. Also from Utomu we wanted the hulking guard played by Gareth Davis to reappear to vex Carl. Gareth was more than eager to suit up again (it was hard to believe it was now two years later), although a continuity mistake was made on which side of his face his scar appeared (although it was a mirror universe he appeared in, right?). Little known facts about the movie: The letters the Doctor steps on in order to navigate the maze are D-E-A-T-H, but did you notice which letter is missing from the alphabet? Answer below. (T's script had worked out where all the letters were supposed go and in which row). The letters themselves were traced from huge transparencies I had made at work. Someone got the bright idea of pasting them on the 1x1 mirrors and letting them spin around. The letters used in the room were our old friends, D-E-A-T-H, again.... Yes, those were real jelly-babies the Doctor used to defuse the maze, purchased from The British Pantry in Redmond, Washington.... The quarry used was in Renton, Washington and at first the crew was very excited that finally we would get to film in a quarry. However, this enthusiasm was soon dissipated after having to lug the TARDIS in pieces a quarter mile to the location from the road.... Broken Doors was our only Doctor Who movie not to have the ending massively changed. All three previous movies had needed a fix of one sort or another: The Wrath of Eukor was supposed to end with the Doctor saying, "I am the Doctor" but Barbara's reading of the line was all wrong. I had her redub it and the movie ends with a bit of a gag with Grant and Carl looking on saying, "She's going to give him some headache." which originally had gone before the Doctor's line. Visions of Utomu originally had enough footage to be a two-parter and in fact Howard Carson and I edited it that way complete with cliffhanger. This longer version has only been ever shown once (to a test audience at a Rusting TARDIS meeting) and now sits deep in my vault (only to be released again on the Special Edition Director's Cut DVD -- if we ever make one). What was supposed to happen, and was filmed and edited, was the character of the Princess was going to become a companion (kind of a Leela-in-reverse who would evolve from a fairy princess to a ruthless warrior), but when we watched the rough cut it became evident this wasn't going to work. So most of the scenes with the Princess were cut drastically, and the ending changed so now she didn't go off with the Doctor and Carl. In Pentagon West, the final scene was part of the second story that was never shot. As a result, we had to add a hastily dubbed line by the Doctor in order to have some kind of ending to the movie.... Final bit of trivia: Michael Santo was credited for playing the Manager in Broken Doors as "E. Kim Tonas", an anagram of his name (nobody ever seems to catch this).... The missing letter in the maze was I. The movie was edited off line by Bill Corrigan and then assembled on Betacam at Alpha-Cine by Alan Halfhill. Wesley Galloway (Dan Wilcken's cousin) did the original music. The movie premiered at Norwescon alongside a little video we did in the meantime...Star Trek: The Pepsi Generation. 18 minutes. Betacam video. Filmed November 1987, released March 1988. Cast. . . Barbara Benedetti as The Doctor, Michael Santo as The Doctor and the Manager, Randy Rogel as Carl Evans, Gareth Davis as the Soldier. All the above listed movies are available directly from Ryan K. Johnson on DVD--which are digitally remastered (home-made DVD-R format made on a Toshiba RD-XS52, may not be compatible on all players). $4 for one copy featuring all four movies including postage. For mailing instructions or more information, e-mail Ryan at rkj@eskimo.com. Please specify which movies you are interested in, the format you'd like, and your country (if not USA).